Power and accuracy for dropping big game from a distance. Extend your reach! When ordinary calibers just won't cut the mustard, it's time to reach for the Bushmaster® BF BA50 .50 cal. 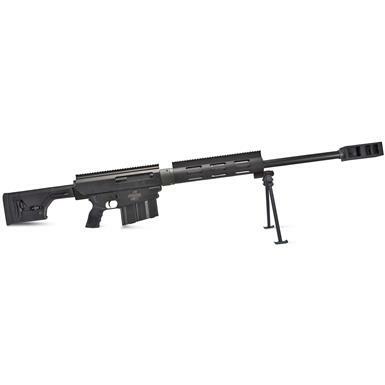 BMG Bolt Action Rifle. Drop the hammer on targets all the way out to 2,000 yards or more! Left bolt / right port design allows you to squeeze off multiple rounds in seconds, while the included steel bipod ensures rock-solid accuracy. Bushmaster BF BA50, Bolt Action, .50 BMG, 30 Barrel, 10+1 Rounds is rated 5.0 out of 5 by 2. Rated 5 out of 5 by Bossfatcat from Awesome rifle! Finally someone designed it right! I absolutely love this BA50, I love it more than my Barret 107! Only thing I don't like is the trigger pull is at 12#'s, I am working with Dakota Arms to help resolve this issue! It has an AR chassis. I have the B.O.R.S. W / Leupold optics and performs really well. Definitely would recommend! Rated 5 out of 5 by Phil from Great gun, very accurate This is an awesome gun, I put the eliminator 4 scope on this rifle and what an amazing combination.My rifle came with a much smaller muzzle brake than shown but seems very effective. Rifle has very little kick ( could shoot it all day).Only complaint is that this gun is very heavy, you wouldn't want to carry it for very long but I guess that's the trade off for a very very accurate weapon.